Christmas is fast approaching and as a mum of five I have to be prepared. We have so many family gifts to buy I have to start my shopping early. I tend to pick up stocking fillers as and when I see something that would be ideal for one of the children. 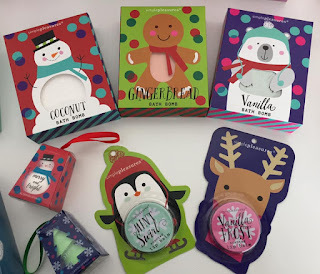 Poundland over the past few years have always done a great range of bath and beauty products which are ideal to go in the children's stockings and this year there are more great products on offer. I have been looking in my local store for a week or two now as I knew their Christmas range was due on the shop floor at any time. So when I popped in earlier this week and saw that the shelves had been stocked I filled my basket ready to stash away for Christmas. First up is this amazing three pack of unicorn shaped bath bombs. 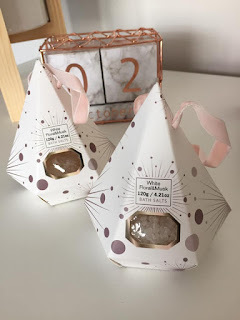 Bath bombs are very popular in our house and as well as being stocking fillers these would be great as gifts for when the children have birthday parties to go to. 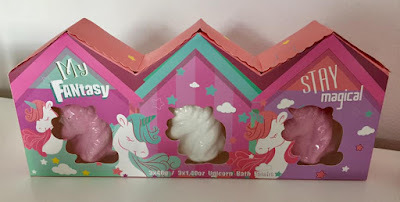 Three pack of unicorn bath bombs all for just £1! There are also the larger snowman, gingerbread man and polar bear bath bombs in coconut, gingerbread and vanilla scents. Also pictured are some scented lip balm and shaped beauty make pop sponges. 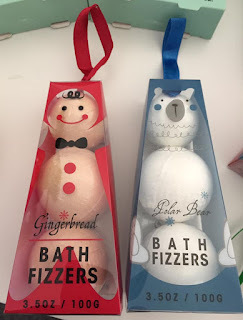 More bath fizzers, the Things love their bath bombs!. A three pack of small bath fizzers making up a gingerbread person and a polar bear, cute little gifts. Finally I picked up these white floral musk vanilla bath salts with hanging ribbon. These look lovely and again a great little gift for stocking fillers, or as token gifts for friends and relatives too. 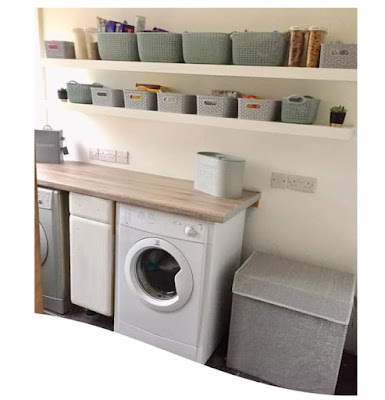 In the main picture at the top of the page there are also 2 similar shaped bath bombs on the opposite side of the picture to these. I am sure I caught them just as they were putting all of their new products out and there will be more to come over the next couple of weeks. For now I have made a good start with my Christmas shopping. So head down to your local Poundland today and grab some fab festive bath and beauty stocking fillers ready for the Christmas season.